Background: The extent of resection (EOR) of a tumor is a proven prognostic factor in patients undergoing surgery for suspected high grade glioma. A few recent publications have shown the importance of intraoperative magnetic resonance imaging (iMRI) with 5-aminolevulinic acid (5-ALA) fluorescence-guidance in order to maximally increase the EOR. Aim: The objective of our study was to calculate the effect on survival of patients with high grade gliomas of resection using both iMRI and 5-ALA fluorescence-guidance as intraoperative adjuncts. Methods: Thirty-seven patients with gadolinum-enhancing high gliomas on preoperative MRI undergoing surgical excision were included in a prospective study. Surgeries began under white-light conditions. Intermittently, a blue light filter was switched on to search for remaining tumor tissue not visible to the naked eye. When gross total resection (GTR) was thought to have been achieved, iMRI was done to check for any contrast-enhancing part left behind. Surgery was concluded or resumed based on the iMRI findings. Histopathological examination of the tumor tissue was done. All patients underwent immediate postoperative MRI at the end of the surgery to calculate the EOR. Results: Our results showed that out of the total of 37 patients, 17 patients died during the follow up period and 11 patients were still alive. The mean survival was 587.1 days and median survival was 491 days with a range of 342 to 943 days. When we compared these figures with the average survival in patients with a high grade glioma, i.e., 9 to 14 months, it showed that both the above mentioned modalities were very helpful in increasing the EOR, and in turn, the overall survival. Conclusions: The use of iMRI as well as fluorescence-guidance are appropriate methods to improve the extent of resection in surgery of contrast-enhancing gliomas. Best results can be achieved by the complementary use of both modalities. For surgical resection of high grade gliomas, the use of iMRI as well as fluorescence-guidance are appropriate methods to improve the extent of resection. Best results can be achieved by the complementary use of both modalities. The advent of intraoperative MRI (iMRI) has allowed neuronavigation to be updated and has helped to further excise residual tumor tissue.,,, A few studies have already shown that continued excision of residual tumor using iMRI and updated neuronavigation is not associated with fresh neurological deficits postoperatively., The benefits of fluorescence-guided resection of HGGs using 5-aminolevulinic acid (5-ALA) has already been proven by a randomized phase III trial, and the advantages of iMRI-guidance in increasing the extent of resection (EOR) has been shown in a randomized trial. We are presenting our experience of using both iMRI and 5-ALA together to increase the EOR of the tumor in patients with HGGs, especially glioblastoma multiforme (GBM). This study was approved by our Institute's Ethical committee and conducted in a prospective manner. Thirty seven patients with gadolinum-enhanced lesions on preoperative MRI suggestive of HGG (World Health Organisation [WHO] grade IV including GBM) underwent surgical excision using both iMRI and 5-ALA induced fluorescence guidance. Only patients with primary HGG on the final histopathology report were included. All patients were explained regarding the benefits and risks of surgery and the advantages of using 5-ALA prior to obtaining a duly signed informed consent for the procedure. Approximately 4 hours prior to surgical incision, the patient was shifted to a dark room and given 5-ALA in an oral dose of 1 g in 30 ml drinking water. They were then shifted to the operating room covered in a blanket. The surgery was conducted under white-light conditions with a microscope using neuronavigation guidance obtained from a preoperative MRI dataset. During the surgery, the operating neurosurgeon switched between white and blue light filter of the operating microscope to achieve gross total excision until no residual tumor tissue was fluorescing in the surgical cavity. At this point, or whenever there was a doubt regarding the extent of involvement during surgery, an iMRI scan (plain T1-weighted images, T2-weighted images, and gadolinium enhanced T1-weighted images) was performed using BrainSuite and the neuronavigation data was updated automatically. If the iMRI images were suggestive of residual gadolinium-enhanced regions, further resection was carried out. In all cases, an immediate postoperative MRI was carried out to document the EOR. The obtained tumor tissue was sent for histopathological examination, that was conducted based upon the current World Health Organization classification. Postoperatively, the patients were kept in the intensive care unit (ICU) in a dark room for at least 24 hours after ingesting the dye, and a noncontrast computed tomography (CT) scan of the brain was performed at the bedside the next morning using a portable CT machine to check for any complications. The patients were kept under close watch until the day of hospital discharge. As per the recommendations of the local tumor board discussions, the patients received adjuvant treatment based on the final histopathology report. Regular follow-up of the patients was done every 3 months, either over the phone or during their follow-up visits in the Neurosurgery or Radiation Oncology departments. We have analyzed and present various outcome parameters in our series. Out of the 37 patients, 15 (40%) were in the age group of 60–69 years, 11 (29%) patients were in age group of 50–59 years, whereas 4 (10%) patients were in age group of 30–39 years and 70–79 years, respectively [Table 2]. Most of the patients (N = 19, 51%) included in the study presented with chief complaint of headache, which was dull in nature, intermittent, and nonlocalizing. The second most common presenting symptom was memory loss or forgetfulness, which was present in 9 patients (24%). Some patients presented with focal neurological deficit which includes slurring of speech, weakness of limbs, and facial palsy, and one patient presented with foot drop. Seizures were uncommon and only one patient presented with this manifestation. One patient presented with vision loss and one with urinary incontinence. Majority of the lesions were found in the frontal (11 patients) and temporal (12 patients) lobes. There were 2 lesions in the parietal lobe. Twelve lesions (32%) were found to be in more than one lobe, i.e., frontotemporal (4 patients), frontoparietal (1 patient), temporoparietal (3 patients), and parieto-occipital (4 patients) [Table 3]. We had 14 (38%) right-sided lesions and 23 (62%) left-sided lesions in which fluorescence guided surgery was done. This was the most variable feature of the lesions and the volume of the lesions ranged from 1.09 cm 3 to 192.72 cm 3. Most of the lesions (N = 30) had a volume of less than 10 cm 3, whereas rest of the lesions (N = 7) had a volume of more than 50 cm 3. Any tumor reaching up to the surface shows a pink fluorescence in the blue light filter. In the case of deep-seated lesions, a corticectomy was made and the tumor was identified grossly based on its grayish discoloration. [Table 5] After reaching the tumor, resection was started in white light. The blue light was switched on for identification of the tumor margin, and resection was done under the white and blue light as per the requirements. The tumor tissue showed a variable fluorescence, and blood and necrotic parts of tumors appeared darker. Most of the GBM (World Health Organisation grade IV) lesions showed an intense fluorescence as pink color on blue light activation; and, at the margins of tumor cavity, resection was done in blue light as fluorescence helped in the delineation of malignant tissue from normal tissue [Figure 1], [Figure 2], [Figure 3]. No residual lesion was found among 36 patients (97.29%). Residual lesion was found in 1 (2.7%) patient in whom the lesion was near the eloquent cortex, and further excision would have led to a postoperative deficit, as judged by the operating surgeon. The histopathology, as per the WHO criteria, turned out to be GBM grade IV in 34 (91.89%) patients. while it was different in 3 patients. The report was anaplastic oligodendroglioma grade III in 2 patients, and oligoastrocytoma grade II progressing to grade III in 1 patient. Other histological markers for the presence of a high grade glioma (HGG) were necrosis, mitosis, and microvascular proliferation. Necrosis was present in 30 (81%) patients and mitosis was seen in 31 (83.78%) out of 37 patients. Microvascular proliferation was seen in 33 (89%) patients. Glial cell marker, glial fibrillary acidic protein [GFAP], was positive in all the included patients. p53 was positive in 31 patients and negative in 3 patients. Proliferation marker Ki 67 showed wide variations [Table 4]. Very few cases of adverse effects associated with the use of 5-ALA during glioma surgery have been reported. The main adverse effects were short lived and included itching and redness of the skin. There was no major adverse reaction due to the use of ALA dye in patients. Other complications secondary to the surgical procedure were also noted. Our operating room is separate from the MRI room. Potential patient transfer difficulties related to this design may have occurred; however, no complications directly related to the intraoperative imaging procedure were observed. To date, no untoward events have occurred in association with the use of either magnetic or nonmagnetic instrumentation in the 1.5-T high-field MRI environment. No clinically significant hemorrhage was observed in the immediate post-operative MRI scans. No anesthesia-related problems or complications have been encountered. The major complications were those that required additional treatment for their management. The patients had wound infection as their main complication in 6 patients (16%). In the early postoperative period (during the first postoperative month), different complications were observed in 3 cases (8%). One patient developed hydrocephalus during the postoperative period and underwent a ventriculoperitoneal shunt insertion. One patient with a lesion situated at the left motor cortex developed increase in weakness on the opposite side; the patient partially recovered after an intensive postoperative physiotherapy and rehabilitation. One patient with a right frontal GBM developed postoperative infection of the bone flap, requiring antibiotic therapy, ultimately resulting in the removal of infected bone flap. Patients were followed up after surgery till progression was detected by imaging during the follow-up period or when there was development of any new symptom. The last follow up was done in January 2016. All patients underwent postsurgery adjuvant therapies as per the standard guidelines for HGGs. Patients were followed up either during their subsequent outpatient department visits or telephonically. Out of the total 37 patients, 11 patients are still alive, 17 died during the follow-up period, and 9 were lost to follow-up [Table 6]. 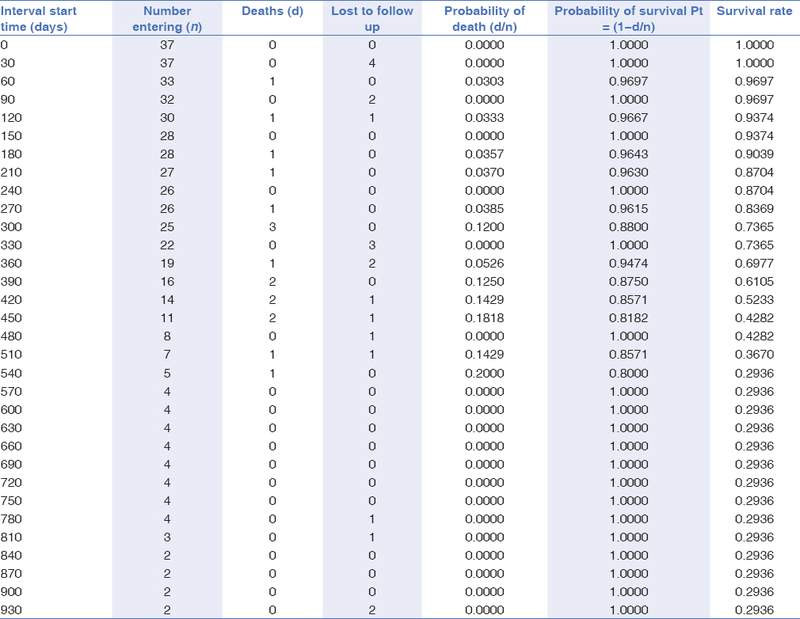 The mean survival was 587.1 days and the median survival was 491 days with a range of 342 to 943 days [Table 7], [Table 8], [Table 9], [Table 10]. Prolonged survival in HGG patients is proportional to the gross total resection (GTR), which is measured by the absence of contrast-enhanced residual tumor on postoperative scans.,, It is advisable that radical resection of any GBM should be done without causing any major neurological deterioration as the postoperative functional neurological status is of significant importance in the prognosis of such patients. iMRI-guided and/or 5-ALA fluorescence guided surgery for GBM are reliable methods to improve the extent of resection (EOR).,,,, Newer studies, such as ours, have combined 5-ALA and iMRI to achieve the maximum EOR in GBMs or other HGGs. Both the modalities are useful in detecting any tumor tissue left behind unintentionally. The data presented here are in accordance with the findings already published in the current literature. It has already been shown by various published articles that both iMRI and 5-ALA are highly specific in indicating areas of the high grade tumor, may it be in the form of contrast enhancement on T1-weighted image or fluorescence seen during surgery using 5-ALA. Histopathology reports are almost always positive for HGG, if it has already been predicted by the abovementioned modalities. Some authors have gone on to state that 5-ALA fluorescence-guided radical excision of HGGs might sometime lead to temporary neurological deficits., The surgical complications in our series using this modality, however, were within acceptable limits. A few studies reporting the combination of iMRI and 5-ALA have been published earlier, namely by Coburger et al., Roder et al., Eyüpoglu et al., Tsugu et al., and Gessler et al. All these reports included a small group of patients or they were not randomized. Therefore, further studies will be required to actually ascertain the comparative or additive value of these modalities. Radical tumor resection is associated with better patient outcomes , and prolonged survival in most cases undergoing GTR in patients with a GBM. The most plausible explanation is that the cells along the margins of the tumor are frequently ignored during resection; however, in reality, they are the most important determinants of fate of the patients.,,,, In our patient series, the median overall survival (OS) was more than 1 year (374 days) after surgery. No major conclusions can be drawn based on the published series; however, continued work in this regard will further change the way GBM surgery has been conceptualized. Our centre is one of the very few centres in India using 5-ALA in fluorescence-guided surgery for HGGs. At the end of our follow-up period, 11 patients were still alive. Although the patients were not classified based on the latest WHO histopathological classification of 2016, future analysis will definitely include the same. We plan to continue using 5-ALA and evaluating the operative results in the follow up period regularly. Pichlmeier U, Bink A, Schackert G, Stummer W. ALA Glioma Study Group. Resection and survival in glioblastoma multiforme: An RTOG recursive partitioning analysis of ALA study patients. Neuro Oncol 2008;10:1025-34. Sanai N, Polley MY, McDermott MW, Parsa AT, Berger MS. An extent of resection threshold for newly diagnosed glioblastomas. J Neurosurg 2011;115:3-8. Albert FK, Forsting M, Sartor K, Adams HP, Kunze S. Early postoperative magnetic resonance imaging after resection of malignant glioma: Objective evaluation of residual tumor and its influence on regrowth and prognosis. Neurosurgery 1994;34:45-60. Keles GE, Chang EF, Lamborn KR, Tihan T, Chang CJ, Chang SM, et al. Volumetric extent of resection and residual contrast enhancement on initial surgery as predictors of outcome in adult patients with hemispheric anaplastic astrocytoma. J Neurosurg 2006;105:34-40. Hall WA, Galicich W, Bergman T, Truwit CL. 3-Tesla intraoperative MR imaging for neurosurgery. J Neurooncol 2006;77:297-303. Hatiboglu MA, Weinberg JS, Suki D, Rao G, Prabhu SS, Shah K, et al. Impact of intraoperative high-field magnetic resonance imaging guidance on glioma surgery: A prospective volumetric analysis. Neurosurgery 2009;64:1073-81. Kuhnt D, Ganslandt O, Schlaffer SM, Buchfelder M, Nimsky C. Quantification of glioma removal by intraoperative high-field magnetic resonance imaging: An update. Neurosurgery 2011;69:852-62. Senft C, Seifert V, Hermann E, Franz K, Gasser T. Usefulness of intraoperative ultra low-field magnetic resonance imaging in glioma surgery. Neurosurgery 2008;63(Suppl 2):257-66. Senft C, Franz K, Ulrich CT, Bink A, Szelényi A, Gasser T, et al. Low field intraoperative MRI-guided surgery of gliomas: A single center experience. Clin Neurol Neurosurg 2010;112:237-43. Muragaki Y, Iseki H, Maruyama T, Kawamata T, Yamane F, Nakamura R, et al. Usefulness of intraoperative magnetic resonance imaging for glioma surgery. Acta Neurochir Suppl 2006;98:67-75. Stummer W, Pichlmeier U, Meinel T, Wiestler OD, Zanella F, Reulen HJ. ALA-Glioma Study Group. Fluorescence-guided surgery with 5-aminolevulinic acid for resection of malignant glioma: A randomised controlled multicentre phase III trial. Lancet Oncol 2006;7:392-401. Senft C, Bink A, Franz K, Vatter H, Gasser T, Seifert V. Intraoperative MRI guidance and extent of resection in glioma surgery: A randomised, controlled trial. Lancet Oncol 2011;12:997-1003. Stummer W, Novotny A, Stepp H, Goetz C, Bise K, Reulen HJ. Fluorescence guided resection of glioblastoma multiforme by using 5-aminolevulinic acid induced porphyrins: A prospective study in 52 consecutive patients. J Neurosurg 2000;93:1003-13. Louis DN, Ohgaki H, Wiestler OD, Cavenee WK. WHO Classification of Tumours of the Central Nervous System. 4 ed. Lyon: IARC press; 2007. Senft C, Forster MT, Bink A, Mittelbronn M, Franz K, Seifert V, et al. Optimizing the extent of resection in eloquently located gliomas by combining intraoperative MRI guidance with intraoperative neurophysiological monitoring. J Neurooncol 2012;109:81-90. Stieber VW. Low-grade gliomas. Curr Treat Options Oncol 2001;2:495-506. Sanai N, Berger MS. Glioma extent of resection and its impact on patient outcome. Neurosurgery 2008;62:753-64. McGirt MJ, Chaichana KL, Gathinji M, Attenello FJ, Than K, Olivi A, et al. Independent association of extent of resection with survival in patients with malignant brain astrocytoma. J Neurosurg 2009;110:156-162. Lamborn KR, Chang SM, Prados MD. Prognostic factors for survival of patients with glioblastoma: Recursive partitioning analysis. Neuro Oncol 2004;6:227-35. Sala F, Lanteri P. Brain surgery in motor areas: The invaluable assistance of intraoperative neurophysiological monitoring. J Neurosurg Sci 2003;47:79-88. Neuloh G, Pechstein U, Schramm J. Motor tract monitoring during insular glioma surgery. J Neurosurg 2007;106:582-92. Feigl GC, Ritz R, Moraes M, Attenello FJ, Than K, Olivi A, et al. Resection of malignant brain tumors in eloquent cortical areas: A new multimodal approach combining 5-aminolevulinic acid and intraoperative monitoring. J Neurosurg 2010;113:352-7. Mehdorn HM, Schwartz F, Dawirs S, Hedderich J, Dörner L, Nabavi A. Highfield iMRI in glioblastoma surgery: Improvement of resection radicality and survival for the patient? Acta Neurochir Suppl 2011;109:103-6. Szelenyi A, Gasser T, Seifert V. Intraoperative neurophysiological monitoring in an open low-field magnetic resonance imaging system: Clinical experience and technical considerations. Neurosurgery 2008;63(Suppl 2):268-75. Coburger J, Engelke J, Scheuerle A, Thal DR, Hlavac M, Wirtz CR, et al. Tumor detection with 5-aminolevulinic acid fluorescence and Gd-DTPA-enhanced intraoperative MRI at the border of contrast-enhancing lesions: A prospective study based on histopathological assessment. Neurosurg Focus 2014;36:E3. Stummer W, Tonn JC, Mehdorn HM, Nestler U, Franz K, Goetz C, et al. Counterbalancing risks and gains from extended resections in malignant glioma surgery: A supplemental analysis from the randomized 5-aminolevulinic acid glioma resection study. Clinical article. J Neurosurg 2011;114:613-23. Diez Valle R, Tejada Solis S, Idoate Gastearena MA, Garcia de Eulate R, Dominguez Echavarri P, Aristu Mendiroz J. Surgery guided by 5-aminolevulinic fluorescence in glioblastoma: Volumetric analysis of extent of resection in single center experience. J Neurooncol 2011;102:105-13. Stummer W, Stepp H, Möller G, Ehrhardt A, Leonhard M, Reulen HJ. Technical principles for protoporphyrin-IX-fluorescence guided microsurgical resection of malignant glioma tissue. Acta Neurochir 1998;140:995-1000. Tonn JC, Stummer W. Fluorescence-guided resection of malignant gliomas using 5-aminolevulinic acid: Practical use, risks, and pitfalls. Clin Neurosurg 2008;55:20-6. Stummer W. The fear of 5-ALA—is it warranted? World Neurosurg 2014;81:e30-1. Roberts DW, Valdés PA, Harris BT, Fontaine KM, Hartov A, Fan X, et al. Coregistered fluorescence-enhanced tumor resection of malignant glioma: relationships between delta-aminolevulinic acid-induced protoporphyrin IX fluorescence, magnetic resonance imaging enhancement, and neuropathological parameters. Clinical article. J Neurosurg 2011;114:595-603. Hirschl RA, Wilson J, Miller B, Bergese S, Chiocca EA. The predictive value of low-field strength magnetic resonance imaging for intraoperative residual tumor detection. Clinical article. J Neurosurg 2009;111:252-7. Seifert V, Gasser T, Senft C. Low field intraoperative MRI in glioma surgery. Acta Neurochir Suppl 2011;109:35-41. Aldave G, Tejada S, Pay E, Marigil M, Bejarano B, Idoate MA, et al. Prognostic value of residual fluorescent tissue in glioblastoma patients after gross total resection in 5-aminolevulinic Acid-guided surgery. Neurosurgery 2013;72:915-20. Pope WB, Sayre J, Perlina A, Villablanca JP, Mischel PS, Cloughesy TF. MR imaging correlates of survival in patients with high-grade gliomas. AJNR Am J Neuroradiol 2005;26:2466-74. Roder C, Bisdas S, Ebner FH, Honegger J, Naegele T, Ernemann U, et al. Maximizing the extent of resection and survival benefit of patients in glioblastoma surgery: High-field iMRI versus conventional and 5-ALA-assisted surgery. Eur J Surg Oncol 2014;40:297-304. Eyüpoglu IY, Hore N, Savaskan NE, Grummich P, Roessler K, Buchfelder M, et al. Improving the extent of malignant glioma resection by dual intraoperative visualization approach. PLoS One 2012;7:e44885. Tsugu A, Ishizaka H, Mizokami Y, Osada T, Baba T, Yoshiyama M, et al. Impact of the combination of 5-aminolevulinic acid-induced fluorescence with intraoperative magnetic resonance imaging-guided surgery for glioma. World Neurosurg 2011;76:120-7. Stummer W, van den Bent MJ, Westphal M. Cytoreductive surgery of glioblastoma as the key to successful adjuvant therapies: New arguments in an old discussion. Acta Neurochir 2011;153:1211-8. Kreth FW, Thon N, Simon M, Westphal M, Schackert G, Nikkhah G, et al. Gross total but not incomplete resection of glioblastoma prolongs survival in the era of radiochemotherapy. Ann Oncol 2013;24:3117-23. Glas M, Rath BH, Simon M, Reinartz R, Schramme A, Trageser D, et al. Residual tumor cells are unique cellular targets in glioblastoma. Ann Neurol 2010;68:264-9. Quick J, Gessler F, Dützmann S, Hattingen E, Harter PN, Weise LM, et al. Benefit of tumor resection for recurrent glioblastoma. J Neurooncol 2014;117:365-72. Moiyadi AV, Stummer W. δ-Aminolevulinic acid-induced fluorescence-guided resection of brain tumors. Neurol India 2015;63:155-65. Moiyadi A, Sridhar E. Intraoperative fluorescence reveals diffuse subpial spread in glioblastoma. Neurol India 2015;63:960-3. Gessler F, Forster MT, Duetzmann S, Mittelbronn M, Hattingen E, Franz K, et al. Combination of intraoperative magnetic resonance imaging and intraoperative fluorescence to enhance the resection of contrast enhancing gliomas. Neurosurgery 2015;77:16-22.